Guess you know the situation: you look at pictures and immediately you want to be there. You want to know more about it. 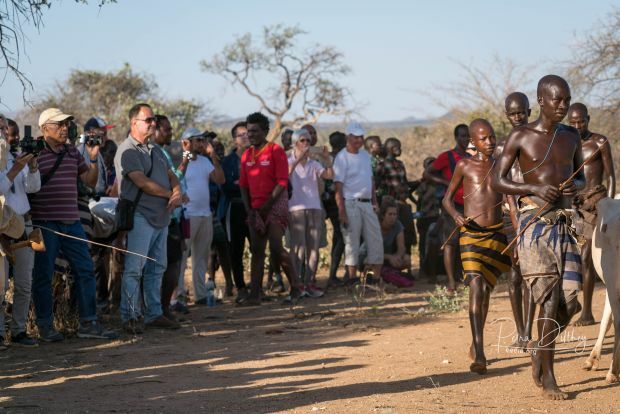 This happened to us when we saw photos about different ethnic groups in the South Omo Valley in Ethiopia like the Mursi, Abore, Surma, Nyangatom, Hamar or Karo. By the way the old Greek philosophers believed that curiosity, the urge to look “behind the things” is the start of any philosophy. Karo tribe at the Omo river, © Petra Dilthey, ethno e-empowerment (eeem.org). Month later seven o’clock in the morning sitting in a SUV on our way from Jinka to a Mursi village we learned that we are not alone in our curiosity. There was a “caravan” of almost 20 four wheel driven cars with people from all over the world which are heading for the same goal: seeing the Mursi and taking photos of them. When we finally entered a village a kind of “show” started – it was basically the script for the whole trip: Our tour guide, whom we have paid for, goes with the local guide to the elders and asks for permission and hands money over to them. Then we are allowed to enter the place which looks “kind of empty” but all of a sudden children and women appear – mostly decorated – and present themselves asking for money (Birr = the local currency). Now we have two options: either we directly pay 5 to 10 Birr per photo (it is about 30 Cents or 0,3 Euro) or we give the guide several hundred Birr and he is organizing the pay out. 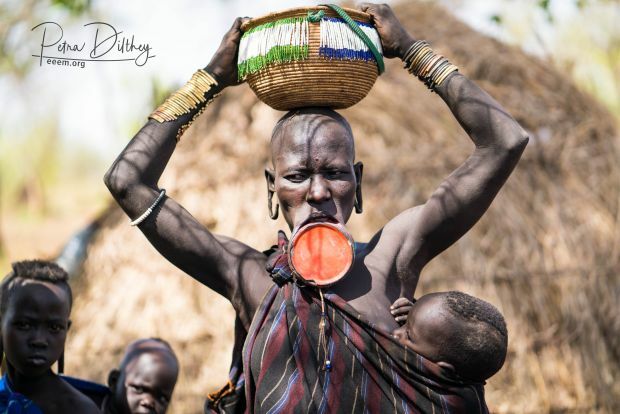 Mursi woman with lip plate (the bigger the more beautiful), © Petra Dilthey, ethno e-empowerment (eeem.org). Curiosity turns into a circus. But we wanted to look “behind the things” and not only watching a performance. We show them our eBooks because we want to know, if they grasp the content, if they like our playful, interactive eeem.org approach. 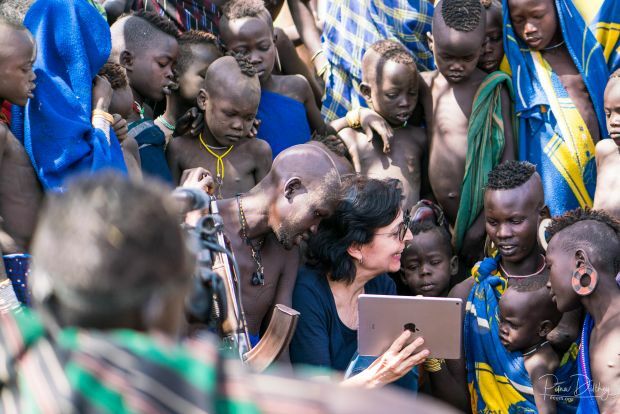 Showing our eBooks in a Mursi village © Uli Schwarz, ethno e-empowerment (eeem.org). Often we got positive feedback and could start a discussion but there was also this woman in an Arbore village who bluntly said: “Stop talking (and wasting our time), take your photo, give the money and go (so we are ready for the next tourists to come)”. OK, we learned the lesson; it is all about a performance for tourists to make money. Tourists watching a Hamar ceremony, © Petra Dilthey, ethno e-empowerment (eeem.org). Maybe that could be a task for the new prime minister Dr. Abiy Ahmed Ali?